There really isn’t much to write about in this particular post other than I recently received some Foursquare “swag.” About a week ago I asked Dennis Crowley for some branded merchandise so I could help promote the company when I’m in Atlanta. Promote. Foursquare. Atlanta. Awesome. That’s pretty much how the chat went between us. Shortly after our chat Dennis was nice enough to hook me up by shipping out some stuff so I could pass it around inside my circle of friends as well as share it with potential “Foursquare-ers.” I’ll be keeping a few items for myself of course. Actually, take a look at the polo shirt in the photo below. In my opinion, that’s a nice looking polo shirt. 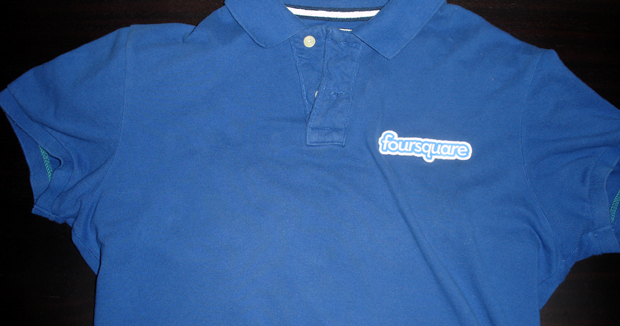 Unfortunately this is not an official Foursquare polo shirt. Since the trim color on the Foursquare sticker matched the color of one of my polo shirts I decided to place the sticker over the embroidered logo design just to see how it would look. Looks good, eh? Anyway, thanks to @Dens, @Mari, and the @Foursquare team for the hook up as always. 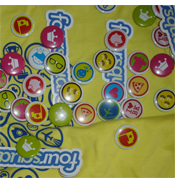 For those of you who don’t know, Mari works at Foursquare and designs the badges we all unlock, among other things. She was nice enough to ship everything to me on behalf of Dennis so I wanted to send her a “thanks” too. How Mayorships are Awarded on Foursquare? 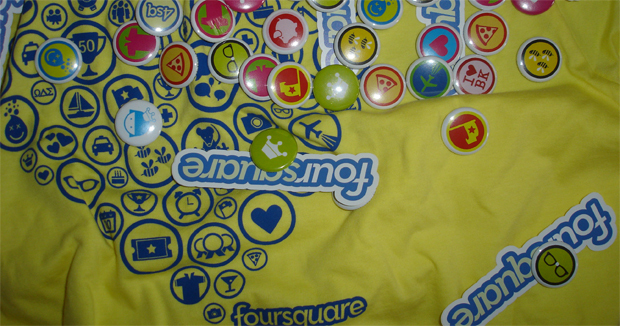 How Can I Suggest a Foursquare Badge?